These new probes mean that our consistent tip sharpness and minimal variation of mechanical properties can now be applied to electrical AFM measurements. The Spark 70 Pt is our conductive AFM probe for electrical characterisation in both contact mode and AC modes (non-contact/soft-tapping). With a nominal 2 N/m spring constant and 70 kHz resonant frequency, the Spark 70 Pt has the same mechanical specifications as the Scout 70 probe. Applications include; Electrical AFM measurements in contact mode; including conductive AFM (CAFM) and piezoresponse microscopy (PFM), and in AC mode; electrostatic force microscopy (EFM), scanning kelvin probe microscopy (SKPM) and scanning impedance microscopy (SIM). The Spark 350 Pt is our conductive AFM probe for electrical characterisation in AC modes (non-contact/tapping). With a nominal 42N/m spring constant and 350 kHz resonant frequency, it has the same mechanical specifications as the Scout 350 probe. Applications include; Electrical AFM measurements using AC modes; including electrostatic force microscopy (EFM), scanning kelvin probe microscopy (SKPM) and scanning impedance microscopy (SIM). 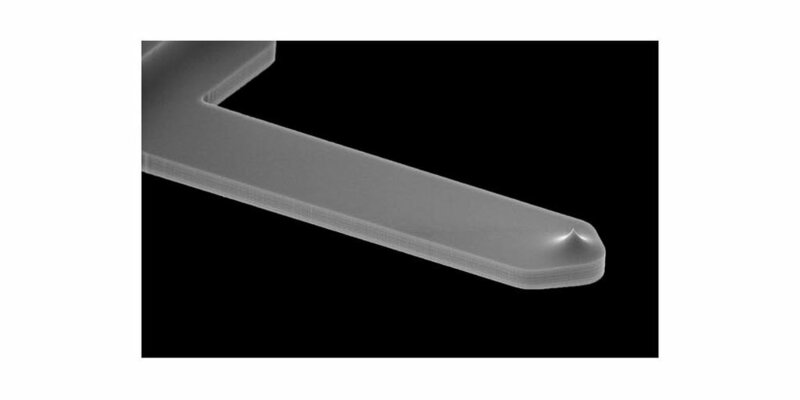 The two models of conductive AFM probes have 40 nm platinum coating with a 5nm titanium adhesion layer on both sides of the probe and a tip radius of less than 30 nm exhibiting exemplary dimensional tolerances and tip sharpness, characteristic of all our AFM probes. Click on the links below for more detailed specifications and pricing. Spark 70 Pt - conductive AFM probe for electrical characterisation in both contact mode and AC modes (non-contact/soft-tapping) with Pt conductive coating on both sides. Spark 350 Pt - conductive AFM probe for electrical characterisation in AC modes (non-contact/tapping) with Pt conductive coating on both sides. The Spark model is compatible with most commercially available AFMs capable of electrical characterisation. NuNano is a UK-based company specialising in the design and manufacture of consistently high-performance probes for atomic force microscopy and cantilever-based sensor devices.